17 South Sudanese civilians have been killed during air raids by Sudan’s military, an official said. South Sudan’s military spokesman Philip Aguer said those killed were cattle herders in West Bahr al-Ghazal state – further west than other recent clashes. Sudan has denied the allegations but Col. Philip Aguer said no other power in the region could carry out the bombing. The south seceded from Sudan in July but there have been numerous clashes along their common border. The UN estimates that several hundred thousand people have been displaced by fighting in the border areas of South Kordofan, Blue Nile and Unity state. “This [attack in West Bahr al-Ghazal] is a hostile aggression that Khartoum has been conducting against the civilian population,” Col. Philip Aguer told the BBC’s Focus on Africa programme. Sudan’s army had also bombed areas in Unity state since Wednesday, he said. It wanted to draw up the north-south boundary by force and annex Unity state because it was rich in oil, Col. Philip Aguer said. Pro-northern and southern groups have clashed in the past in West Bahr al-Ghazal state over grazing and water rights. Sudan’s army spokesman Sawarmi Khaled Saad denied they had carried out the air strikes, the AFP news agency reports. “This information is completely incorrect,” he is quoted as saying. Sawarmi Khaled Saad said South Sudan was, in fact, amassing troops in Unity state to launch attacks across the border. Both countries accuse each other of backing rebels operating in their territory. Sudan’s foreign ministry spokesman Al-Obeid Meruh said that 350 members of a Darfur-based rebel group, the Justice and Equality Movement (JEM) had crossed into South Sudan on Wednesday, AFP reports. He said the international community should put pressure on South Sudan’s government “to stop supporting these troops and disarm them”, AFP reports. JEM’s leader Khalil Ibrahim was killed a few days ago by Sudanese government forces. Sudan’s army said he had been killed in fighting as he tried to cross into South Sudan, but JEM said he died in an air strike. 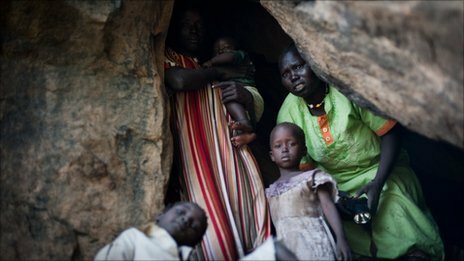 Various mediation efforts to end the conflict in Darfur, and to ease tension between Sudan and South Sudan, have so far failed, analysts say.